This is the third permanent Lumiere installation that we have supported through the Banks Community Fund. A striking new artwork has landed in Durham City thanks to a five-figure grant from North East employer The Banks Group. 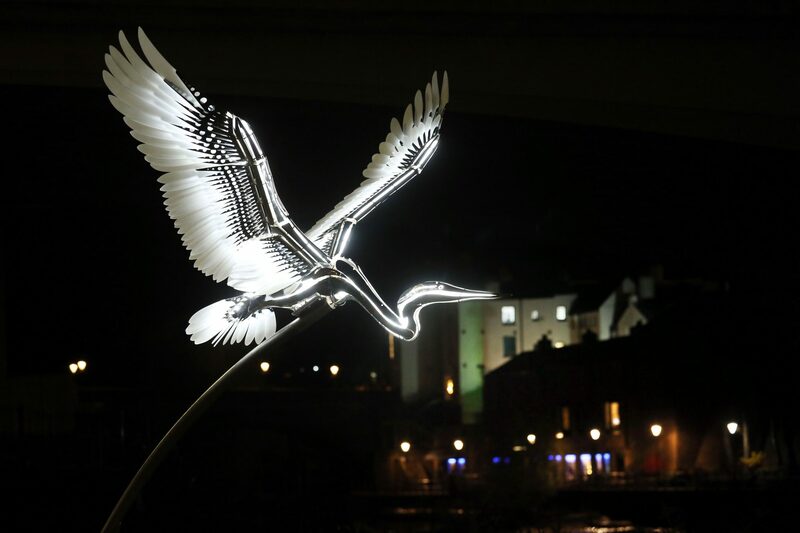 Heron, an illuminated silver homage to one of England’s most magnificent birds, has been unveiled as a permanent public sculpture on the banks of the River Wear next to Millburngate Bridge after a £10,000 Banks Community Fund grant enabled its purchase. Heron was created by artist Jon Voss and debuted successfully at the 2017 Lumiere Durham festival. It’s the third permanent Lumiere installation that funding from the County Durham-headquartered, family-owned firm has supported in Durham City, following on from Helvetictoc at Clayport Library and Lightbench at Freeman’s Quay. 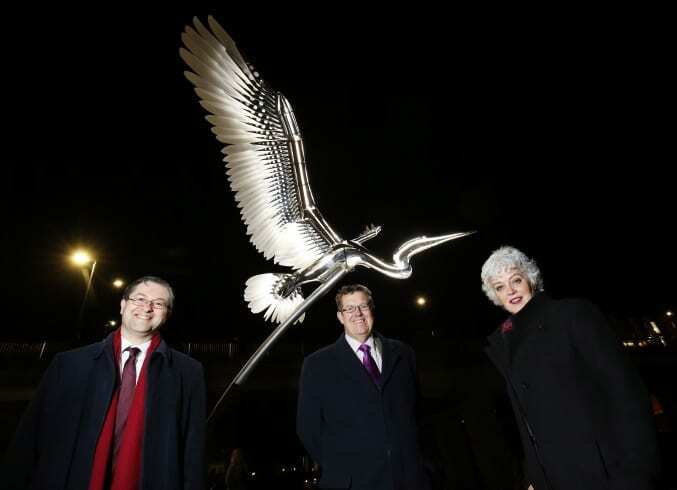 Mark Dowdall, environment and community director at the Banks Group said: “As a longstanding County Durham-based business, we are proud to be helping to further extend Lumiere’s local cultural legacy by enabling the eye-catching Heron to become a permanent part of the Durham City landscape. The biennial Lumiere light festival, produced by leading arts charity Artichoke and commissioned by Durham County Council, will return to Durham city from the 14-17 November next year, with Lumiere 2019 marking ten years since the festival first launched in Durham. The festival, which contributes significantly to the local economy, experienced a record 240,000 visitors in 2017 across an expanded footprint, with more than half of the installations located outside the city’s central peninsula area. Visitors to the 2019 anniversary edition can expect to see exciting new commissions created by UK and international artists, alongside some of the festival’s most memorable installations from the past decade. Simon Henig, Leader of Durham County Council, adds: “Lumiere has been really important for County Durham over the past ten years, attracting tens of thousands of visitors and bringing millions of pounds into the economy. Helen Marriage, Director of Lumiere producer Artichoke, comments: “It’s exciting to be planning for this 10th anniversary edition and I’m especially looking forward to selecting my “Director’s Cut” from previous festivals. Over the last decade, around 150 artworks made by hundreds of artists and technicians have created a magical journey of discovery through the cityscape, involving thousands of community participants”. Sarah Coop, Artichoke’s Development Director, adds: “This has only been possible with the help and support of local sponsors and funders large and small. What is so wonderful aboutLumiere Durham is that it is a massive community effort. Everyone comes together to make it happen. We are calling on local business to support this spectacular anniversary edition and become proud partners in this event which offers a showcase to the world”. The Banks Community Fund is independently administered by the County Durham Community Foundation.